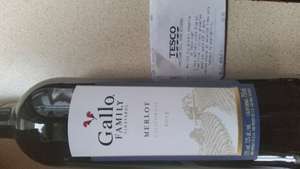 Gallo Family Merlot selling at £3.50 in Tesco. 13% 2013 Californian wine. Probably not the best tasting tipple, but a steal at that price. Will try to put an opinion on later as to its taste, if I remember. £6.99 on line. £3.50 where/how please? Bought in store in Cheetham Hill, Manchester store. See receipt in pic. Yuck! Not worth even £3.50. Sorry! Thanks shiny, but can confirm it's a passable, easy drinking red. Worth the money.